In addition to Ben Cruachan, this section Includes Beinn a` Chochuill, Beinn Eunaich and Beinn a` Bhuiridh. T​he Cruachan massif, situated between Loch Etive and Loch Awe, occupies an area of approximately 20 square miles and includes eight separate tops, two being Munros: Ben Cruachan, the highest point which gives the range its name, and Stob Diamh which lies to the east along a fine ridge almost 4km in length. Ben Cruachan`s main summit can easily be combined with one or more tops but an outstanding, energy-sapping mountain excursion is to include all in a full circuit, plus add on the Corbett Beinn a` Bhuiridh either at the start or finish. Bear in mind that the ridge can prove very challenging in winter when it should only be attempted by those with appropriate experience and gear. 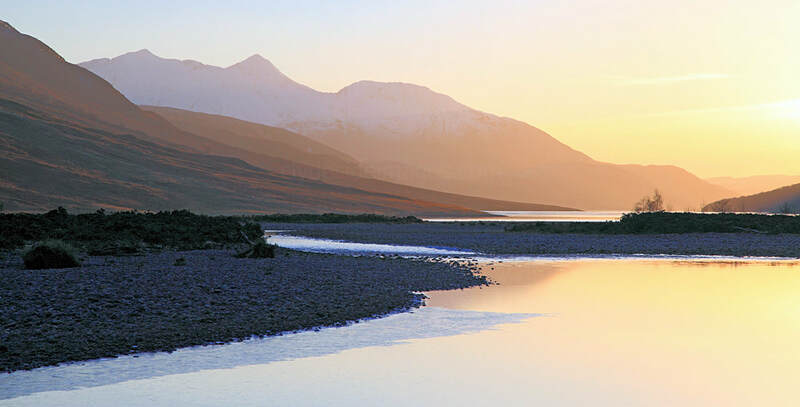 An ideal place from which to appreciate the sheer size of the mountain is from the south side of Loch Awe. The Cruachan Power Station Visitor Centre on the shore of Loch Awe is the most popular starting point although hill walkers are discouraged from using the centre`s car park. Fortunately there is a small lay-by on the opposite side of the main road where the path to the reservoir dam is taken to complete the first stage of the ascent. The visitor centre lies at the east end of the narrow Pass of Brander, an off-shoot of Loch Awe that hems in the A85 Oban road and West Highland railway line between the water`s edge and steep hillside. The pass has always been notorious for landslides and rock-fall therefore the railway is protected by trip wires to automatically set the signals at red should debris end up on the line. The latest incident was in June 2010 when the system failed to stop a derailment of an Oban-bound Sprinter train that resulted in one carriage dangling precariously over the A85. A number of passengers were hospitalised but fortunately none of their injuries were life threatening. The power station, which is hidden deep within the heart of the mountain, has the facility to pump water from Loch Awe, several hundred metres uphill to the reservoir and store it there until needed. At peak periods electricity is generated as the water flows back down to Loch Awe. Cruachan`s reversible pumped storage hydroelectric scheme was the world's first. The path, often muddy, leads under the railway and climbs through woodland alongside the Falls of Cruachan onto the open hillside to eventually join the tarred access road that rises from the A85 near St Conan`s Kirk. GR 115266.(? )The dam towers ahead. Aim for its southwest corner and climb a metal ladder onto the dam wall. Meall Cuanail forms the western side of the reservoir and lies due south of Ben Cruachan. 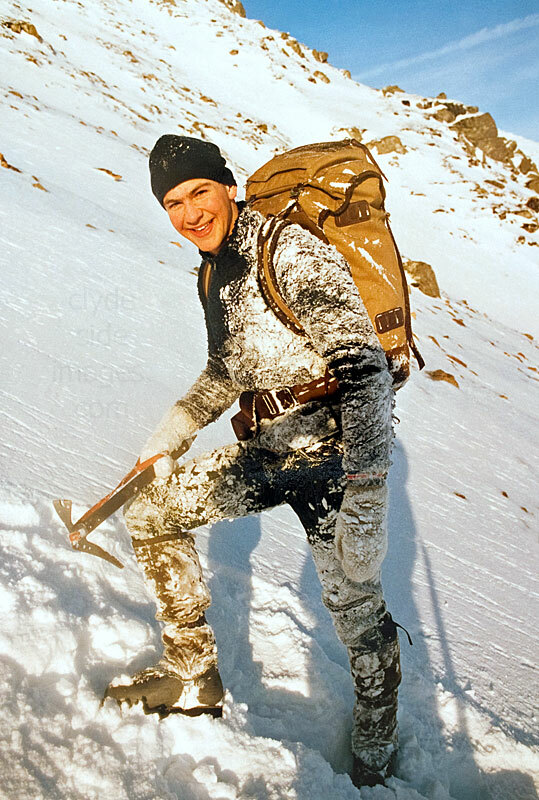 This subsidiary top is regularly climbed on the way to Cruachan`s main summit, particularly as it requires only a moderate degree of additional effort. As an aid in poor visibility, a line of rusted fence posts from the top of Meall Cuanail can be followed down to the connecting bealach in Coire Dearg at 820 metres. Alternatively continue along the track on the west side of the reservoir to the north end where a path strikes uphill to the aforementioned bealach. Thereafter the climb to Ben Cruachan, up boulder-strewn slopes, is fairly steep but straightforward. This is a convenient descent route from the main summit. Hopefully conditions are fine in which case it is worth heading west to take in Stob Dearg, better known as the Taynuilt Peak, for additional seaward views. On return to the main summit you can either descend to the reservoir if you are calling it a day, or head eastwards along the ridge for Stob Daimh (998 m). There are a couple of rock steps to negotiate which can prove awkward in winter and the traverse has an airy feel in places with craggy slopes falling away steeply. The subsidiary top of Drochaid Ghlas, located approximately mid-way between the two Munros, is one of Cruachan`s best vantage points. On looking back from its summit both Ben Cruachan and the Taynuilt Peak appear as near-perfect cones. This un-cairned top, however, lies slightly to the north of the main ridge, and in thick cloud or mist, unless a bearing is taken, walkers could find themselves inadvertently continuing northwards into Glen Noe rather than maintaining the proper line. Stob Diamh, Cruachan`s second Munro, along with its two satellites, Stob Garbh (980m) and Sron an Isean (966m) forms the east-facing Dalmally Horseshoe which is an easier but worthwhile alternative to the full round. The peaks of the Horseshoe can be tackled from the Cruachan dam but it is more practical to start from the B8077 road as this avoids having to retrace the outward route. From Stob Diamh, head south over Stob Garbh and if time and energy permit at the bealach continue southward to take in Beinn a` Bhuiridh to complete our traverse. Alternatively descend directly towards the dam. Many walkers prefer to make a full circuit of the massif from the dam in an anti-clockwise direction, beginning with Beinn a` Bhuiridh, utilising the access road that runs up from the main road near St Conan`s Kirk but the bottom gate is usually locked to prevent access by private vehicles which means Shanks`s Pony all the way. Another option, but seldom used, is an approach from Glen Noe, a remote pass between Loch Etive and Loch Awe. Its north side is formed by another pair of Munros: Beinn a` Chochuill and Beinn Eunaich, both of which provide good views of Cruachan`s peaks and ridges. In addition to the Cruachan Dam Visitor Centre, the east end of Loch Awe holds a couple of interesting diversions including Kilchurn Castle (right). The castle, which dates from the 15th century, was built by the Campbells of Glen Orchy who resided there until 1740. `Cruachan` is the war-cry of the Clan. During the 1745 Jacobite Rebellion Kilchurn was garrisoned by Hanoverian troops. 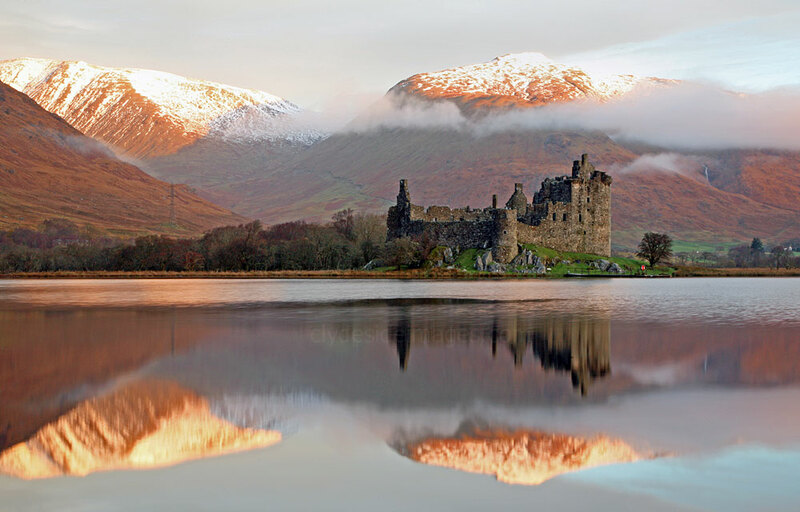 The best view of the much-photographed stronghold is from the south side of Loch Awe, along the A819 Inveraray road just west of its junction with the A85. The walk across the field from the parking area to the loch shore is usually extremely wet and boggy - wellies advised! 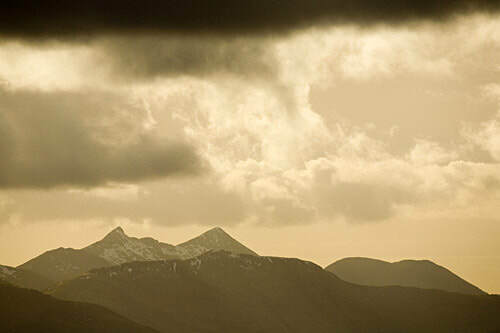 The peaks in the background are Glen Noe`s Beinn a` Chochuill and Beinn Eunaich, both Munros. The castle`s substantial ruins can be explored on foot from a small parking area on the east side of the Glasgow to Oban railway line, reached by a very short, unsigned gravel turn-off on the west side of the A85 about 1km north of the previously mentioned junction. A reasonable footpath leads from there under a railway bridge to the ruins. Ben Cruachan from the head of Loch Etive. I climbed onto the main top via Meall Cuanail, accompanied by a couple of pals. 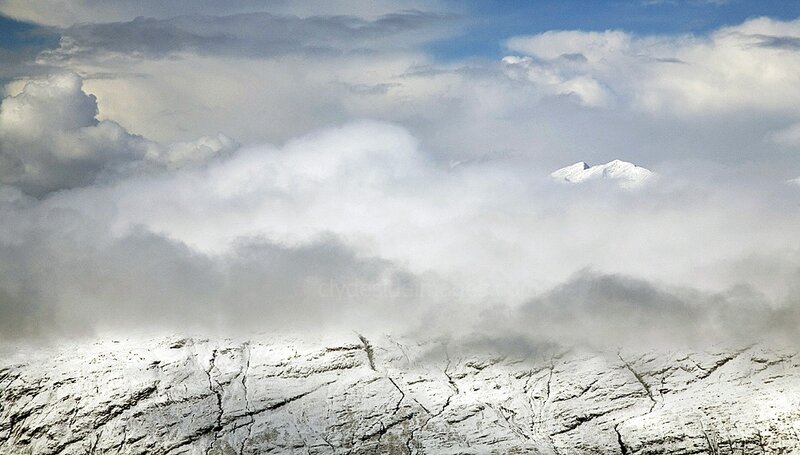 It was a classic winter`s day with lots of snow on the upper reaches and every boulder feathered in ice. Another superb day with lots of snow cover. I started from the A85 as the gate across the access road to the dam was locked and climbed Beinn a Bhuiridh for the first time. I continued onto Stob Diamh and did a circuit of the Cruachan Reservoir. Near the summit of Drochaid Glas I stood on a large slanting slab of rock to admire the view. Suddenly I was on my back, sliding towards the edge. I managed to stop myself with my ice-axe almost immediately but was a bit shaken when I looked over the edge, now only a couple of feet away, and saw the drop! One of my pals brought his mate Andy along who`d just been accepted for officer training in the Royal Marines. They were both super fit and I had trouble keeping up. Starting from Castles Farm we took in Beinn Eunaich first. No problems, initially just a plod up steep grass. There was a fair bit of cloud but it blew clear just before we got to the top. Plenty of snow with large cornices above the north-east corrie. Continuing along to Beinn a` Chochuill we had gloomy views of Ben Cruachan`s Dalmally Horseshoe. Thereafter it was `goggles on` for a lightning glissade on our backsides, several hundred feet down a suitable gully.